A Baton Rouge, LA native, Johnnie Creel graduated from LSU with a Bachelors of Science in Psychology. Johnnie has been licensed in Real Estate in Tennessee, Rhode Island, and Louisiana for more than 30 years. Prior to coming to Tennessee, Johnnie served as an Auditor and Investigator for the Lousiana Real Estate Commission, and she helped to write the first appraisal law in the United States. In 2008, Johnnie became one of the Founding Partners of Keller Williams Realty Knoxville. 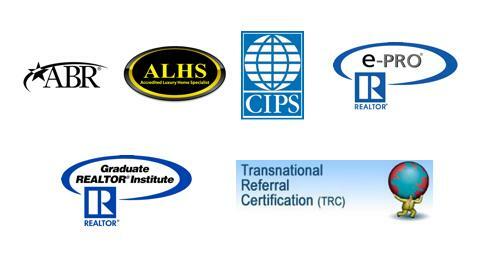 Through continuing Real Estate education, Johnnie holds the ABR, CIPS, CRS, ePro, and GRI designations, as well as the titles of Luxury Homes Consultant and Historic Property Specialist. Johnnie Creel is also a member of the Knoxville Economic Development Committee and Knox Heritage. Johnnie Creel is different from most Real Estate professionals in Knoxville, and she has dedicated herself to building a business based on results. The Creel Group combines Johnnie Creel's more than 30 years of experience in Real Estate with a selling team consisting of 2 Buyer's Agents and a full time Executive Assistant. The Creel Group provides professional photographers, professional home stagers, and many professional vendors to provide a wide range of services to their clients. Pairing Johnnie Creel's thorough market research with the available marketing technology of Keller Williams Realty allows The Creel Group to provide each listing client with a specialized marketing campaign designed for their home. Their strategy markets each property 24 hours a day, 7 days a week with traditional Real Estate marketing avenues such as print and direct mail, as well as utilizing the cutting-edge internet marketing technology of Craigslist, Blogging, and Social Media Marketing. 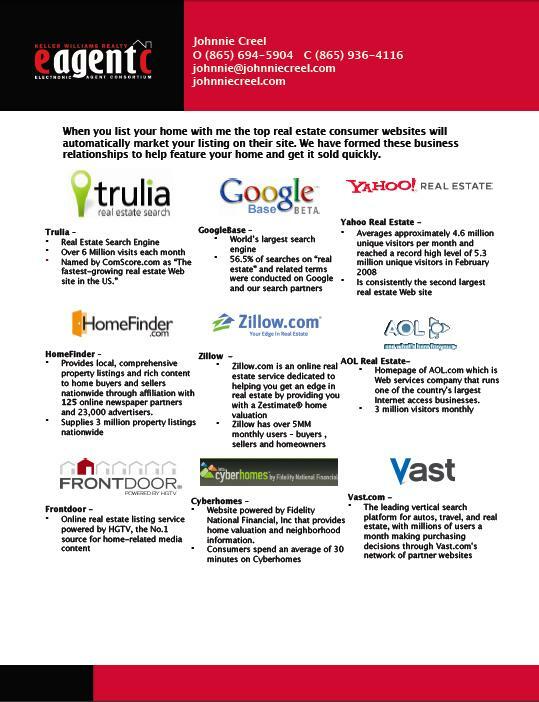 Click here to see a few of the top home buying/selling websites where Keller Williams listings will be posted. Using the most up-to-date market information, Johnnie and her team will carefully advise each seller about the home repairs and improvements that will maximize the asking price, providing the best possible vendors through a personal network of resources. From listing to closing, each member of The Creel Group is committed to navigating the entire sale process, drawing from Johnnie's expertise to sell each home seamlessly for top market value.